Robins descended on Bermtopia about a week ago -- a busy, noisy, welcome advance guard reassuring us that spring will arrive. At some point. They bear an unfortunate taxonomic moniker -- turdus migratorius -- that potentially undermines the springtime creds they bring to thinking, feeling winter-weary Bermtopians. Especially if you're a 7th grade boy and/or an adult with a twisted bent for 7th grade humor. 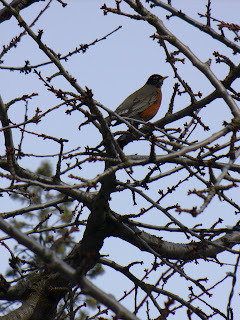 The robins' song, which continues into early summer when they start dealing with their own challenges of parenthood, is startling after weeks of hearing nothing but muted traffic on snow-muffled streets. And their quick, slashing burnt-orange flights across the monochromatic gray and white skyline are mesmerizing. Wherever the robins wintered this year, they were treated well. The birds I've seen dashing, diving and briefly balancing on the tree branches outside my office window are fat AND sassy. They've been gorging on the pods of fruit that still remain on ash trees in my neighborhood. And this Sunday, I watched a half dozen poke around in the flower beds in my front yard (let's hear it for a south-facing front yard -- I can see grass and dirt! ), hoping to find a worm or beetle that missed the memo last fall that read "Dig down DEEP, boys, dig down deep." The robins' arrival also sparked a heightened level of avian hysteria. This weekend, our year-round backyard residents, the house sparrows, frenetically attacked and clung to their birdfeeder all afternoon, landing and taking off en masse in psychotic bursts over and over again. A lone black-and-white stranger I've never seen before made a brief stop in the cherry tree. And a flicker persistently attempted to peck out a love song to his sweetheart on the side of our house -- until Brad threw a stick at it. How embarassing when you're trying to impress your girlfriend. Between the robins' aerial loop-de-loops, the sparrows' crazed entrances and exits, and one lovesick woodpecker -- it was delightful weekend. Welcome back, robins.